Hello Everyone, we are back and normal service will be returned! How can we all survive without the internet, we sure can’t! As today was a driving day there’s not really much to report. 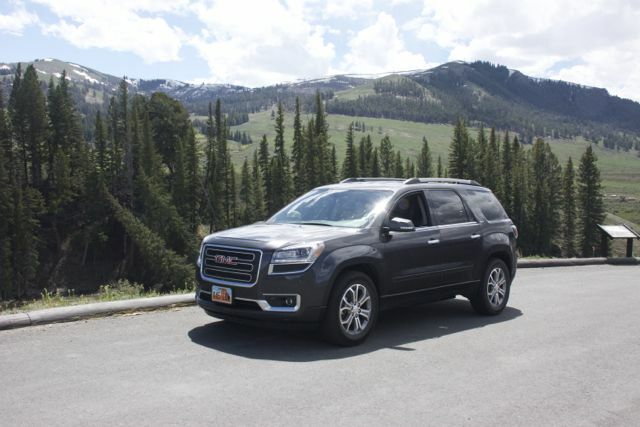 The drive to Yellowstone was a long arduous one, about 6.5 hours, not helped by the fact that ‘Margaret’ our sat-nav took us completely the wrong way for an hour before we finally realised and looked at a good old fashioned paper map, realised her mistake and got back on the right road! At least our ‘beast’ is very comfortable. The other big event was me trapping one of my hands in a heavy metal door! Of course, it just had to be the one that I had already bruised when I feel down in the restaurant at Gatwick. 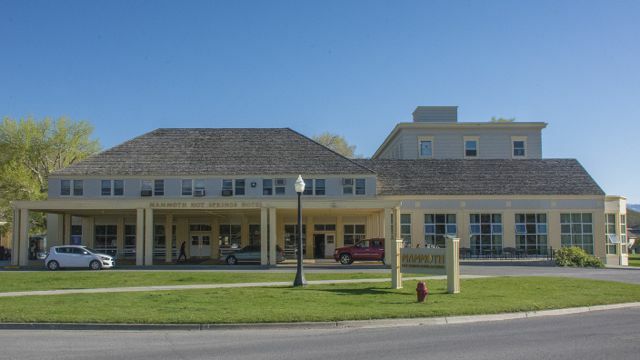 We arrived at Yellowstone and are now all settled in to our hotel, the Mammoth Hot Springs Hotel on the north side of the park. It’s an old hotel, opened in 1937 and they like to keep everything fairly original and rustic so we have no internet, no TV, one usable electric socket, no air conditioning and no wardrobe space. There are five coat hooks on the wall with six coat hangers and just four drawers. We did know this before we came so it did not take us by surprise and we did book a room with a private bathroom so that’s a plus and the location and our view is excellent. We set about booking a hotel last November and even then could only book the five nights we are here as all the other dates and hotels were taken. 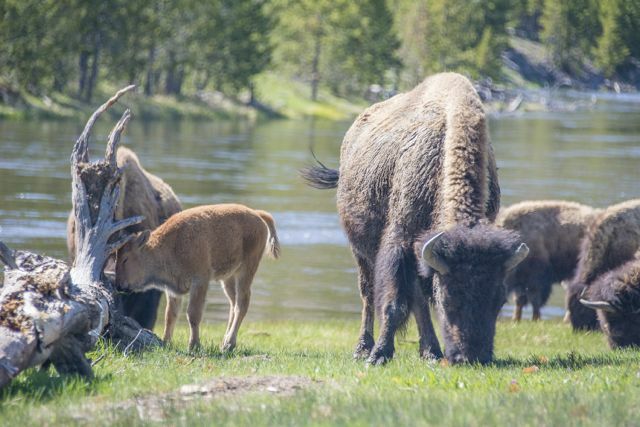 So, a message to all those thinking of coming to Yellowstone ………………. book early! On the drive through the Park we did come across a heard of bison, some with their babies, so here’s a photo to close with. Thank you. Congratulations on your 25th, what a great place to celebrate! Have a wonderful time. I’m not sure who you are as you didn’t leave your name. Have we ‘spoken’ before? Your accommodations look lovely Sandra and even modern. I know looks are deceiving! Still, your photos show it is well worth the price of foregoing modern technology for a few days! I’m gonna live forever, yeah!! Yes, it was worth it Dot, just frustrating.